On 4 December 1997, the Faculty of Law of the University of Pretoria awarded honorary LLD degrees (honoris causa) to President Nelson Mandela and Chief Justice Ishmail Mahomed. President Nelson Mandela receiving an honorary degree from the Faculty of Law at the University of Pretoria. 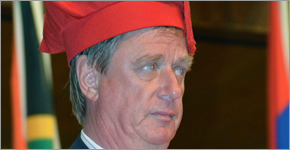 Justice Arthur Chaskalson received an honorary doctorate degree from the Faculty of Law. On the left is Prof Christof Heyns, Dean of the Faculty of Law, and on the right Prof Pistorius, Vice Chancelor and Principal of UP at the time. Constitutional Court Justice Yvonne Mokgoro was awarded a doctorate in law at the University of Pretoria on 22 April 2008. 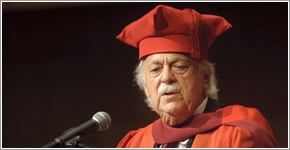 In celebrating international Human Rights Day, the University of Pretoria bestowed an honorary doctorate on distinguished human rights law activist Advocate George Bizos SC and Justice Johann van der Westhuizen on 9 December 2011 and 10 December 2013 respectively.